Qualitative inquiry can have a major effect on evaluation practice, and provides evaluators a means to explore and examine various settings and contexts in need of rich description and deeper understanding. Qualitative Inquiry in Evaluation: From Theory to Practice explores the most important considerations for both students and evaluation professionals. Using various evaluation theories and approaches as a springboard for real-world practice, this reference serves as an accessible text for beginning students and seasoned professionals alike. Readers are given an in-depth view of the key qualities and benefits of qualitative inquiry, which also serves as a crucial counterpart to quantitative analysis. Chapters in part one focus on the foundations, core concepts, and intersection of evaluation theory and qualitative inquiry. Part two contains contributions from leading evaluators whose design, implementation, and reporting strategies for qualitative inquiry are centered on common, real-world settings. These case-based chapters point to the strengths and challenges of implementing qualitative evaluations. Key competencies for conducting effective qualitative evaluations are also discussed. 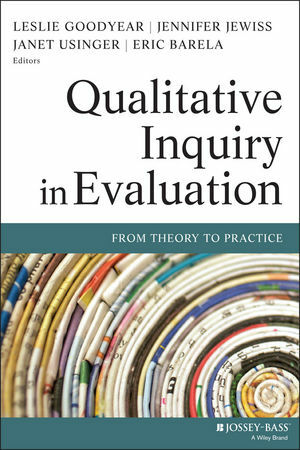 Qualitative Inquiry in Evaluation: From Theory to Practice is a vital tool for evaluators and students alike who are looking to deepen their understanding of the theoretical perspectives and practice considerations of qualitative evaluation. LESLIE GOODYEAR, PHD is a principal research scientist at EDC, with nearly twenty years in the evaluation profession. She is a long-term, active member of the American Evaluation Association, associate editor of the American Journal of Evaluation, and co-chair of the AEA Qualitative Methods Topical Interest Group. JENNIFER JEWISS, EdD is a research assistant professor in the Department of Leadership and Developmental Sciences at the University of Vermont and co-chair of the AEA Qualitative Methods Topical Interest Group. Her work has appeared in the American Journal of Evaluation and Practical Assessment Research & Evaluation. JANET USINGER, PHD is associate professor in the Department of Educational Leadership at the University of Nevada, Reno, and program co-chair of the AEA Qualitative Methods Topical Interest Group. ERIC BARELA, PHD is chief knowledge and impact officer at Partners in School Innovation, and program co-chair of the AEA Qualitative Methods Topical Interest Group.